The International Motorcycle Show rolled through southern California, and despite terrible weather there were plenty of excited enthusiasts mingling amongst the new bikes and gear. One of the highlights was the unveiling of the Mission R electric race bike. 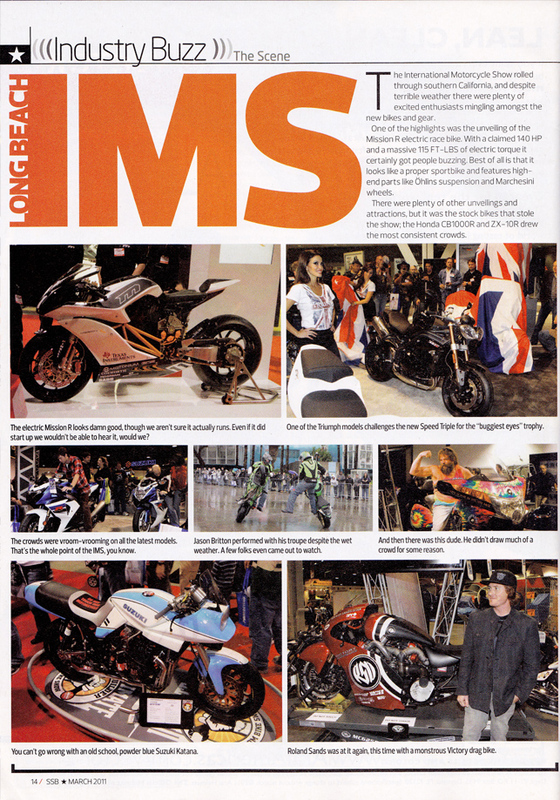 with a claimed 140 HP and a massive 115 FT-LBS of electric torque it certainly got people buzzing. Best of all is that it looks like a proper sportbike and features highend parts like Öhlins suspension and Marchesini wheels. There were plenty of other unveilings and attractions, but it was the stock bikes that stole the show; the Honda CB1000R and ZX-10R drew the most consistent crowds.